Jody McIntyre: Can you tell us about yourself? Ayman Quader: My name is Ayman Talal Quader, I am 23 years old, and I live in the Nuseirat refugee camp, in the middle of the Gaza Strip. JM: What is it like to be a student in Gaza? 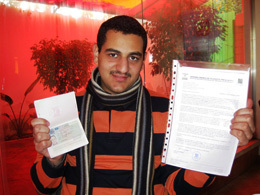 AQ: I finished my degree at the Islamic University of Gaza in January 2008. The situation for students in Gaza is completely different from those studying outside of Palestine. Most students here never get the chance to prove their true potential. I am 100 percent certain that they have the desire and energy to do so, but they are simply not given the space to demonstrate their abilities. Of course, the students are seriously affected by the ongoing siege of the Gaza Strip; we cannot get the materials we need, the books, stationary and even paper! In the most recent war, several of university buildings were either partially, or in some cases completely destroyed. With the borders are still closed, no raw materials are being allowed into Gaza, so those buildings that were destroyed a year ago are still lying in piles of rubble. I remember when I was still at secondary school, it was before the withdrawal of Israeli settlers from Gaza in 2005, and the Israeli army would block the road that ran from where I lived to where my school was. So, from an early age I learned the education of occupation. JM: Are you hoping to continue your studies? AQ: I am hoping to study for my masters at Universitat Jaume I (UJI) in Spain, in a city called Castellon, not far from Valencia. I was a granted a scholarship in November 2009, to study Peace, Conflict and Development Studies. I have all the legal papers I need: a passport, visas, an acceptance letter from the university, supporting letters from nongovernmental organizations in Spain, and even from the Spanish embassy in Cairo. But as you know, the borders are closed, so no one can leave easily. My problem right now is that my studies start in six days from now, on 8 February, and I have no way of leaving Gaza. I have been coordinating with embassies and human rights organizations, but I still haven’t heard anything. My flight leaves from Cairo on 1 February, but if I’m not allowed out then I will lose my ticket. I am so frustrated by this situation. I saw in the news yesterday that Spain is acting as a mediator, to assist myself and 13 other students to leave the Gaza Strip who about to lose their scholarships. So I hope that everything will be OK, and I feel so lucky to have been able not only to get my voice out there, but also to help raise awareness about those other 13 students. JM: If you are not allowed to travel abroad, how do you see your future? AQ: This is a very frustrating question for me. I hope that I will get out without any problems. This is a golden opportunity for me, and I don’t want to lose it under any circumstances, but I do fear for my future. JM: How can students in other countries support your cause? AQ: As students from across the world, we all share one thing in common — the right to education. This is a right supported by international law, supported by the UN, by the European Union and by governments and agencies from all over the world. So all I need is my right, to pursue my studies like any other student. I have already received a lot of support from international students, people who are just like me, especially from those in Spain. They are running a petition, which has received 1,200 signatures so far, they launched a Facebook group called “Open Rafah For Ayman” which many people have joined, and it makes me so happy to see their comments in the group. I have also been interviewed by newspapers, magazines and two days ago by a local Spanish radio station in Castellon, during which I spoke about my story and the ongoing suffering of the Gaza people. JM: What gave you the idea to start your “Voice From Gaza” blog? AQ: During the war on Gaza, I was stuck in my home for 23 days straight, with nothing to do. I didn’t have much experience in writing or blogging at the time, but after the war ended, I felt that I had something to get out of my heart, and found that I could do so through writing. There was one family that was evacuated from their home; they were living very close to where the Israeli troops were stationed at the time, so they were forced to leave. They were being sheltered at my family’s home. They used to walk to their house to check that it hadn’t been damaged and that the rest of their extended family hadn’t been harmed, and they would come back to our house by walking down Salah al-Din Street, the main street in Gaza. It was very clear to the Israeli soldiers that they were civilians walking in the street, looking for shelter. One day, we were waiting for them to come back to our house, when three of the children from the family, while they were on their way, were targeted by an Israeli missile, which had several shrapnel bombs inside, and all three were severely injured. So half of the family were at my home, and the other half were in the hospital. I saw the suffering of their father and their mother in front of me … their home was in danger, and now three of their children were in the hospital with life-threatening injuries, and it was such a tragic situation. So I felt like I had to write something about this. I wrote an article and published it online, and I was shocked by the response; it was translated into several languages, and I was getting emails from people all over the world. So I decided that I would start to write a couple of stories per month, and continued from there. The messages of support push me to keep on writing. JM: It says at the top of your blog that you believe that one day, justice will prevail here. With the siege now tighter than ever, how do you think a solution can be achieved? AQ: What’s happening in the Gaza Strip is a real injustice, and it’s unlawful, in regards to the siege, the war and the suffering of the [Palestinian] people. But to believe in something, is better than not to believe. We are passing through very harsh conditions now, with the closure of the borders, shortages of food supplies and shortages of medicine, but these conditions will not last forever. For myself, I believe that justice will prevail one day, and no one can deny me of this. I am sure that this day will come. JM: What inspires you in life? AQ: The smiles of the people of Gaza. The people of Gaza have lived through everything, and can adapt to any situation; if it is a time of war, they live in war; if it is a time of peace, they live in peace; if it is a time of entertainment, they enjoy themselves! Whatever happens here, they try to live their lives. So when I see children here smiling, laughing, shaking hands and playing games with each other, it gives me inspiration. JM: If you could send a message to the international community, what would you say? AQ: In my case, we were very successful in gaining the support of the media. I think that the European media in particular is finally taking an interest in the plight of the Palestinians, and it is important for people to take advantage of this. The world cannot stay silent forever. This is severe injustice in the Gaza Strip, and our human rights are being violated every day. If the world continues to watch our rights being violated without taking action, then this is a real catastrophe — for all of us. Jody McIntyre is a journalist from the United Kingdom, currently living in Beit Lahiya in the occupied Gaza Strip. Jody has cerebral palsy, and travels in a wheelchair. He writes a blog for Ctrl.Alt.Shift, entitled “Life on Wheels,” which can be found at http://www.ctrlaltshift.co.uk. To contact Jody, and for more information about the Local Initiative, email jody.mcintyre AT gmail DOT com.